Just two days after the Samsung Galaxy S10+ was spotted in the wild, Samsung’s upcoming flagships have leaked out again. 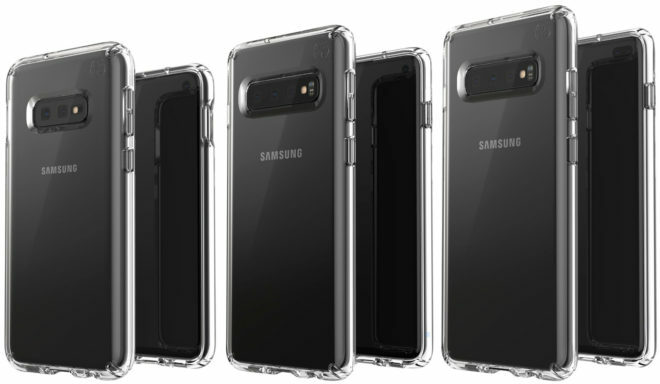 A new image from Evan Blass shows the Galaxy S10E, Galaxy S10, and Galaxy S10+ in cases side-by-side. We can see that all three phones have a hole-punch display, with the Galaxy S10+ packing a wider hole-punch with two cameras in it. Around back, the S10E has a dual rear camera setup, while the S10 and S10+ each have three rear cameras. Samsung is hosting an event on February 20, and the company’s teasers suggest that the Galaxy S10 will be shown off there. Of course, there have been plenty of rumors about the devices ahead of time, suggesting that the phones will have screens that range in size from 5.8 to 6.4 inches. It’s also been said that the Galaxy S10 and S10+ will have in-display fingerprint readers but the S10E won’t. It’s unclear what that E stands for, but it’s looking like that could be Samsung’s lower cost S10 model. Rumors have also said that Samsung is working on a fourth Galaxy S10 model with a 6.7-inch screen and 5G support. T-Mobile has confirmed that it’s working on a 5G Samsung device, so it’s possible that that’s the rumored S10 variant with 5G. Which, if any, of the upcoming Samsung Galaxy S10 models are you interested in? They should ALL be 5G capible. Anything else is BS. If the initial 5g battery drain is as bad as 4g was, Samsung is wise to keep it out of the less expensive phones. AAAANNNNDDDDD I’d bet it won’t be ready until last quarter of the year– so ‘about’ a year it took to put out the first 5G model. I still think Samsung has peaked for phones. Apple sells more in China than they do… 5X more. Samsung can’t compete with Chinese manufacturers… Android devices are commodity quickly sinking to commodity pricing and they have no leverage. iPhones were banned in China and once the ban was lifted of course Apple would see larger sales then Samsung. Outside of China it’s a different story iPhones sales are down overall and Samsung makret share in mobile sales is larger so your comment is pointless. I highly doidoubt the U.S., any carrier in the U.S., will get all 3 models, just like we get a crap choice of colors, BORING white, gray, and black. The lady is so unhappy with her LG V30, we are waiting for these phones. Super excited! I want a phone with a USER REPLACEABLE BATTERY!!!!! I’ll keep my V20 until someone comes out with a high-end phone with a user replaceable battery. Me 2, but now our only semi-practical options will be power cases or a very thin juice pack inside a leather folio’s pocket. Hopefully someone makes one of the future foldable phones with a removable battery. You are going to be using that V20 for a very long time then…. There will also be a 12gb1tb $1,800+ model. The top foldables should top 2k… 2.5k would not surprise me, nor would 3k. Time to start saving and working part time at highway rest stops. Glad I upgraded to the S9 last year when it came out. I’m not a fan of this design nor the cost. Hopefully there will be more appealing designs in the next year or so.